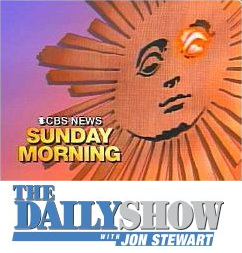 CBS News Sunday Morning has been around for as many years as I’ve been alive. Originally hosted by Charles Kuralt, and since 1994 by the similarly venerable Charles Osgood, it is a show best described as Sunday New York Times Arts & Leisure section meets 60 Minutes. This entry was posted in Comedy, Journalism, Television and tagged CBS News, Charles Kuralt, Charles Osgood, Jane Berman, John Stewart, Mom, Moment of Nature, Moment of Zen, Paul Mercurio, Sunday Morning, The Daily Show on August 31, 2012 by MarcBerm.